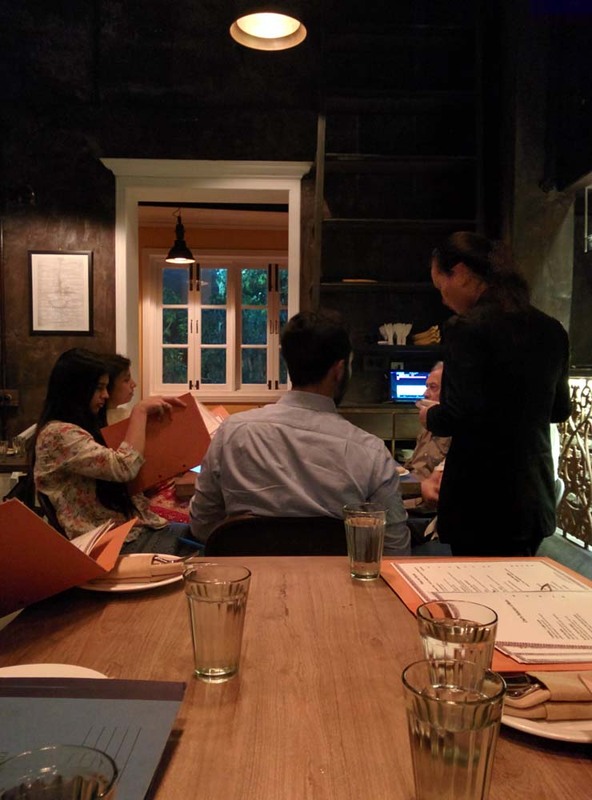 When a restaurant’s cuisines are listed as ‘North Indian, Chinese, Thai, Asian, Continental’, I tend to raise my eyebrows and wonder which—if any—they are really able to do well. In my experience, multi-cuisine restaurants are invariably flops. Town Hall, newly opened in Khan Market, was therefore not a place I was especially keen on visiting. My sister and brother-in-law, however, had dined there recently, and said they liked it. So, when the five of us—my husband and I, my sister, her husband, and their son—decided to go out for a Saturday night meal, we decided to give Town Hall a try. Town Hall is very well-located: it stretches across the very centre of the middle lane in the market, with the thoroughfare corridor on the ground floor actually passing under the restaurant. To get to Town Hall, you have to climb up a couple of flights of stairs (no lifts here), and—after going past a live sushi counter—enter one of the several rooms that make up the dining space. These vary in lighting, style, etc (there’s also a rooftop terrace). We chose to sit in the main dining area in the middle, a high-ceilinged stylish room, its walls painted in a rough-yet-chic splotchy brown. The look here is stylish grunge, if you can imagine it. There are exposed beams and AC ducts, old-style Indian bungalow electric switches. The water glasses on the tables are the thick, faintly green variety in which chaiwallahs often serve tea; the water jugs are actually aluminium tea kettles (again, chaiwallah style). 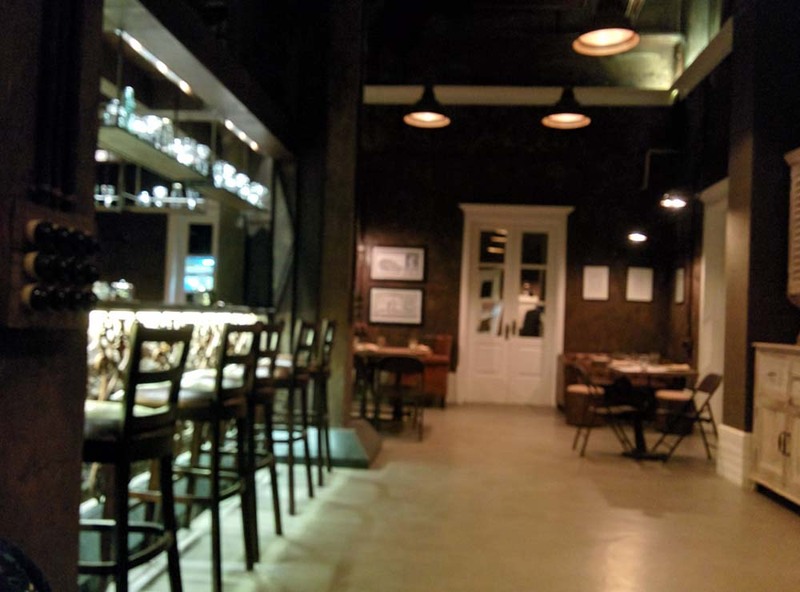 But there’s no mistaking the upmarket nature of this place, which is reflected in the menu. At Town Hall: a view. My sister, my husband and I are diehard sushi fans; my brother-in-law and nephew wouldn’t touch sushi with a barge pole. So the table got divided into two halves: the sushi-eaters and the non-sushi eaters. 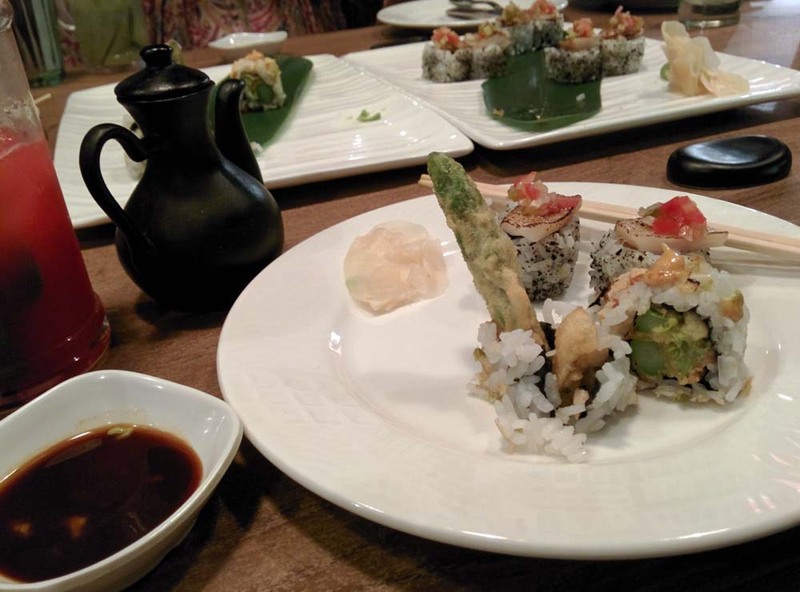 The three of us, after much debating (and some discussion with the knowledgeable and friendly waiter) settled on a Town Hall sushi (with fish and a jalapeno salsa) and a Town Hall vegetarian sushi (with asparagus, avocado, and tempura crumbs). The non-sushi duo ordered a chicken dimsum and a chicken satay for their appetisers. Our drinks—a green melon lemongrass cooler for me, a watermelon kaffir lime cooler for my husband, similar soft drinks for the others—arrived soon after. I loved my cooler: it looked refreshing, with a few little slices of melon, and finely chopped tender lemon grass dotted amongst the ice cubes. It tasted even better: fruity and fresh, and with that gorgeously lemongrassy flavour. The husband’s watermelon drink was equally good. 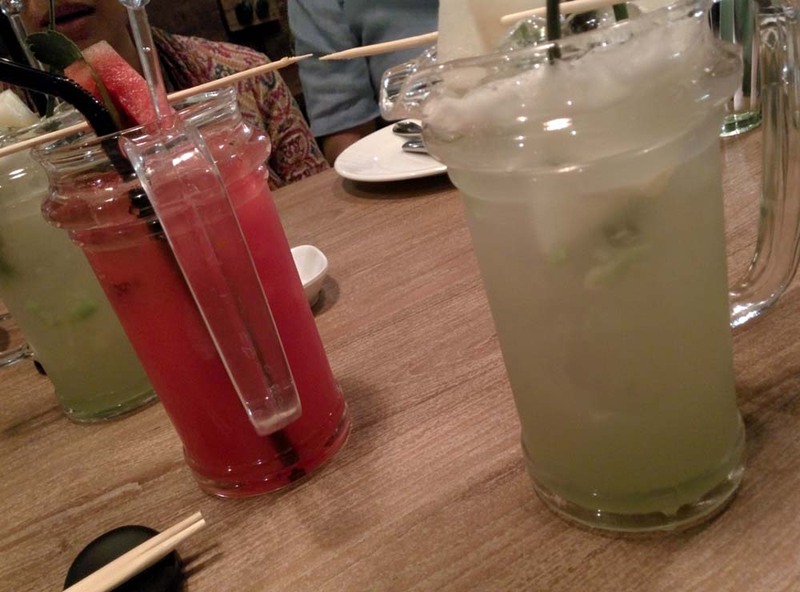 Drinks at Town Hall: a watermelon kaffir lime cooler and a green melon lemon grass cooler. Next up were the appetisers, which arrived within about 10 minutes of our ordering them. My brother-in-law and nephew were happy with theirs (the chicken dimsums had beautifully thin skins, and a flavourful stuffing; the satay—with a minced chicken mixture wrapped seekh-like around lemon grass stalks—got a thumbs up from them too). As did our sushi, from us. Both were melt-in-the-mouth delicious. The vegetarian sushi had a stunning range of textures, with the tempura crumbs adding a great crunch. The non-veg one had very fresh fish, and just enough jalapeno salsa to not seem out of place on a Japanese dish: a fine example of fusion done well. Full marks. 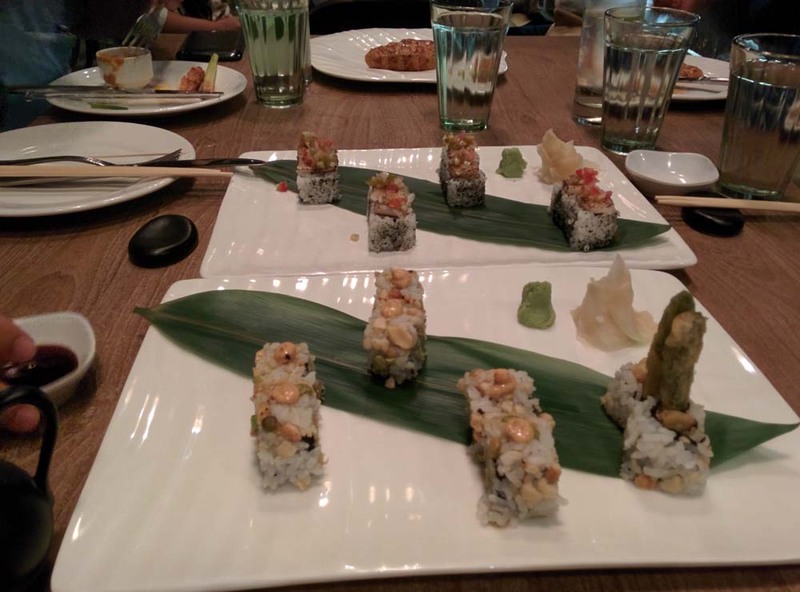 Sushi at Town Hall: the signature sushi, in vegetarian and non-veg versions. Town Hall, sadly, doesn’t offer Japanese mains (I’d have loved a bento box or a don buri to follow that sushi). I therefore had ordered a herb-crusted fish as a mains; my sister ordered a fish in a Malaysian yellow curry paste, steamed in a banana leaf. My husband and brother-in-law (who can’t pass up the opportunity to have tenderloin!) had both ordered that, while our nephew ordered a gnocchi. All of us were very happy with our mains. 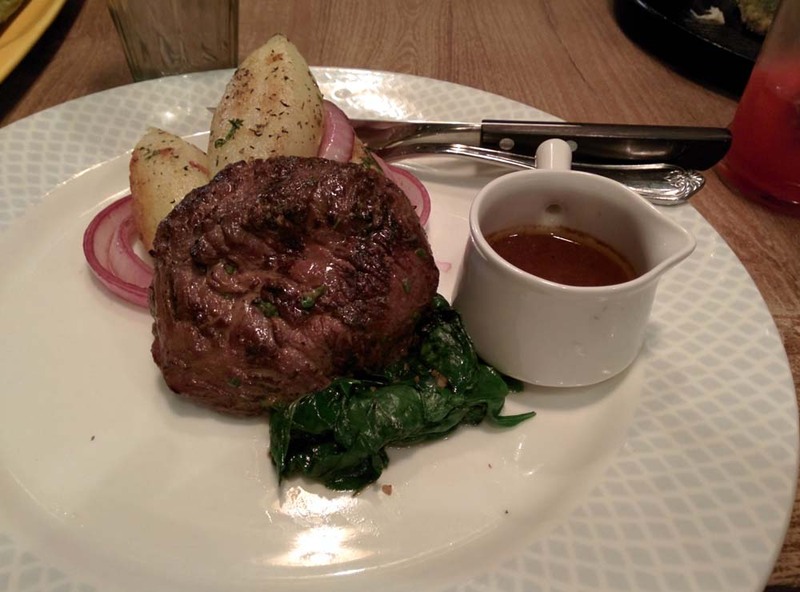 The tenderloin (of which I had a forkful from my husband, after he’s raved about how well it was cooked—medium rare, just the way he wanted it) was served very simply, with cooked spinach, turned potatoes and onions on the side. Delicious, simple, letting the meat and its jus speak for itself. 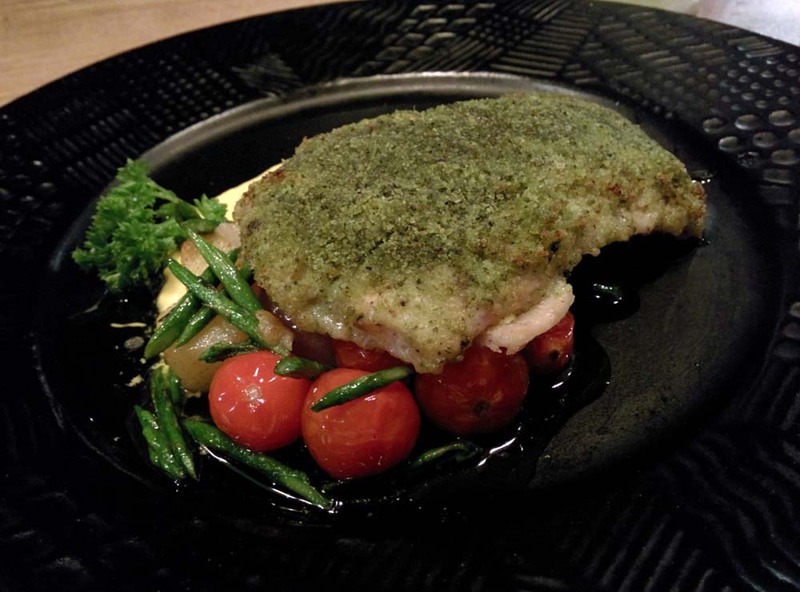 The herb-crusted fish I got had a generous (and crunchy) coating of the herb crust, and was perfectly cooked. It came on a bed of cooked button onions, cherry tomatoes and diced potatoes, with a drizzle of a light sauce and a garnish of chopped chives. Filling yet not heavy, and delicious. Full marks again. Herb crusted fish on a bed of sweet button onions, diced potatoes, and cherry tomatoes. Sadly, Town Hall’s selection of desserts is rather limited, predictable, and unexciting. My sister decided to opt for a coffee instead; my husband skipped dessert; my nephew ordered a New York cheesecake with blueberry sauce; my brother-in-law a black-and-white chocolate cake; and I, the red velvet cake. I can’t comment on the other two desserts, since I didn’t taste them. My red velvet cake, though, was a bit odd. Red, yes, and with the expected white frosting in layers. The frosting, however, didn’t have that mild tang of cream cheese, and the cake itself didn’t taste of the traditional cocoa which it should contain. To be fair, though, it was a beautifully moist and light cake; just not what I’d expect from a red velvet cake. 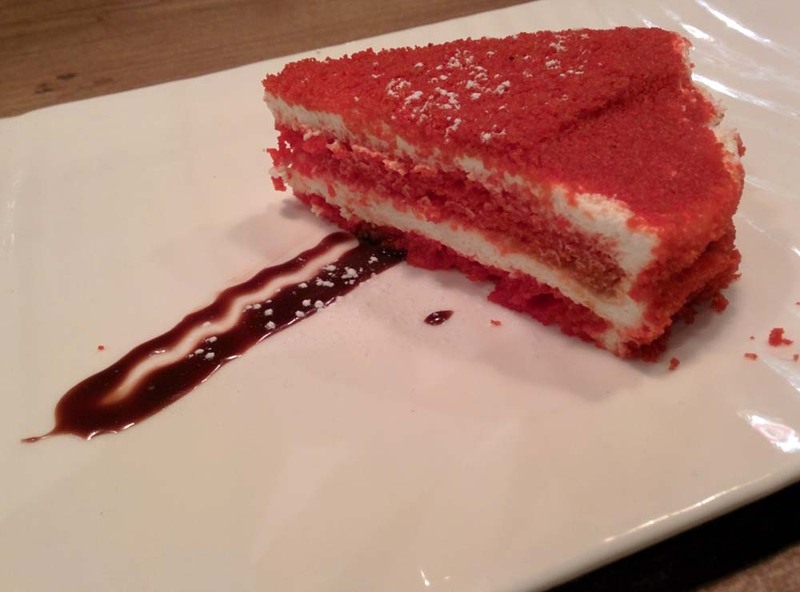 Town Hall’s red velvet cake: moist, but not really what I expect a red velvet cake to be. (One high point of our dessert course was the almond biscotti which came with my sister’s Americano: wafer-thin, light, and exquisite). All in all, this was a good meal. Let Town Hall expand on the Japanese theme a bit (some Japanese mains, perhaps?) and introduce some more interesting (and well-made) desserts, and I’ll be back here in a shot. We paid Rs 9,111 (inclusive of taxes and service charges) for our meal. That is pretty expensive, but considering the quality of the food—barring the dessert—I’d say this wasn’t bad. Do go, especially if you like sushi.